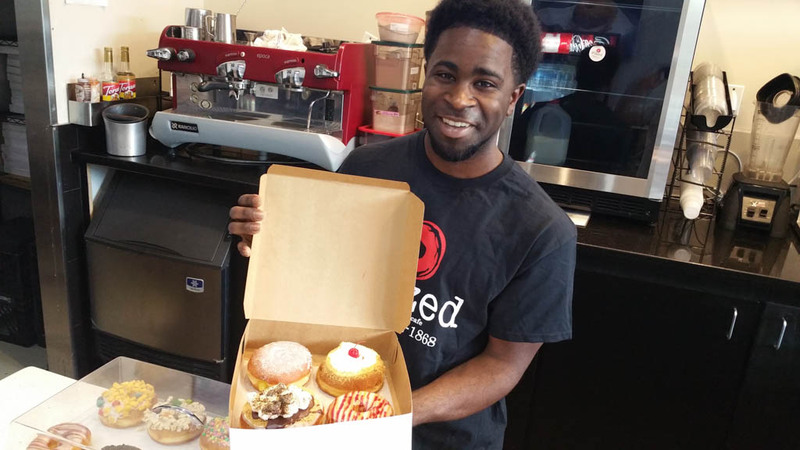 I stopped by Glazed the Doughnut Cafe, located on Old Spanish Trail near Kirby Drive, for a quick bite of lunch and to get some doughnuts to-go for my family. I was quickly greeted with a welcoming smile from Deidra and DJ, who were behind the counter. 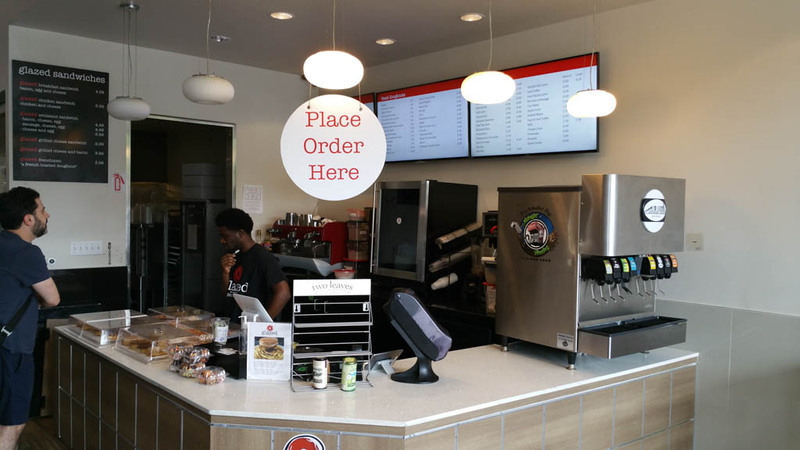 I walked in and noticed they had brightly lit menu boards with their offering underneath; which was a full set up to make coffee, espressos and lattes. To the right of the counter was a self-service fountain drink machine featuring Oak Cliff Beverage Works—they offer real sugar sodas. 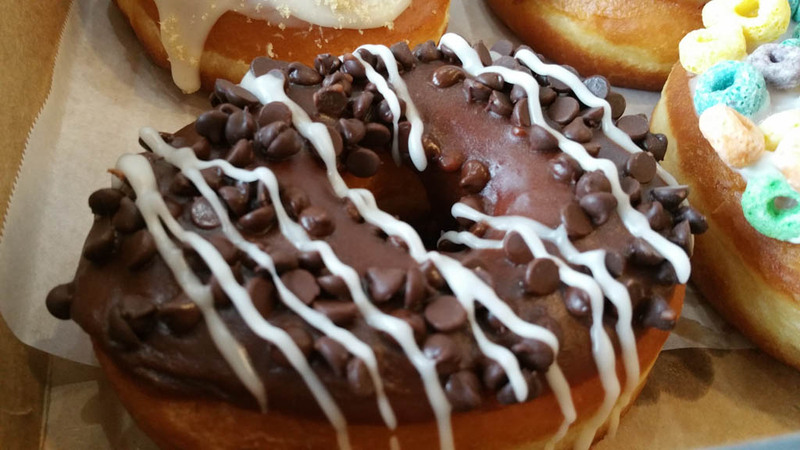 On the counter, you’ll immediately notice what makes Glazed extraordinary—one of each of their 44 gourmet doughnuts. 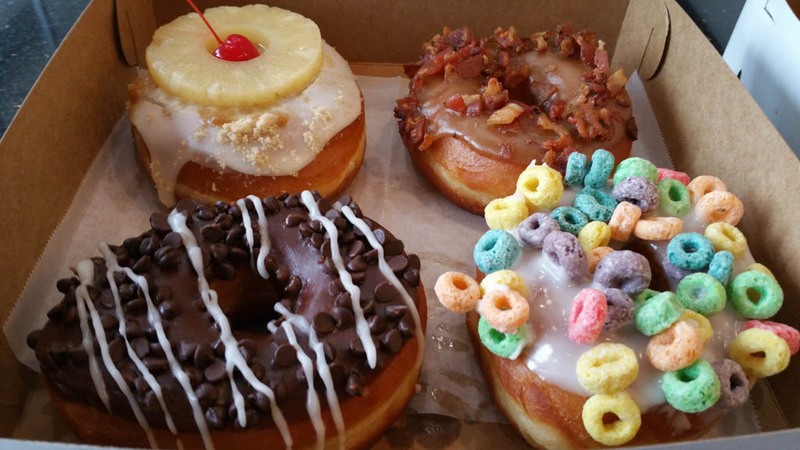 I say gourmet because many of the beautiful doughnuts are not something you will find at your average donut shop. 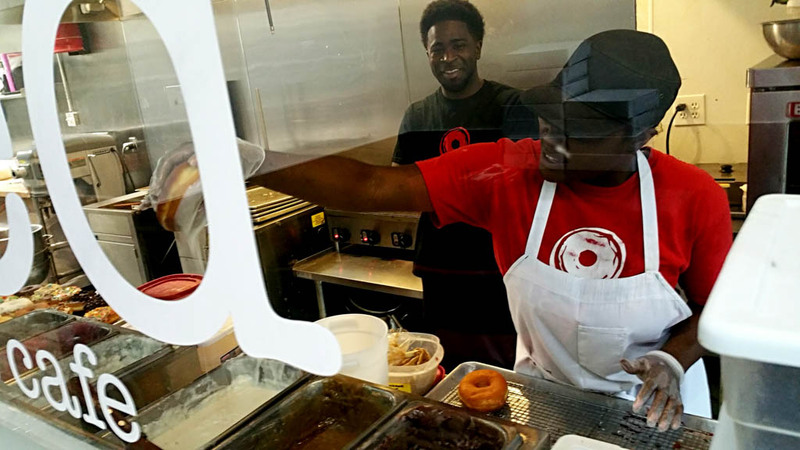 All their doughnuts are made to order, which you can see through the long window just past the ordering counter. 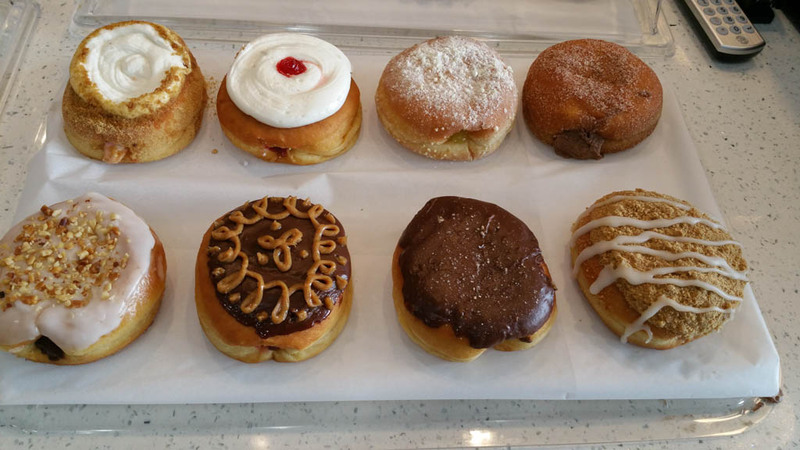 I was able to see fresh doughnuts get dipped, filled and topped. 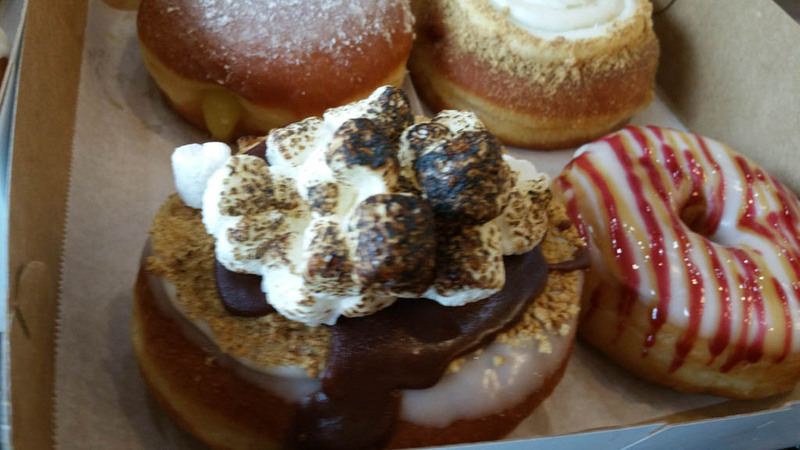 I even got to see the marshmallows on top of a doughnut get blowtorched, melted and slightly charred for one of Glazed Signature S’mores doughnut. 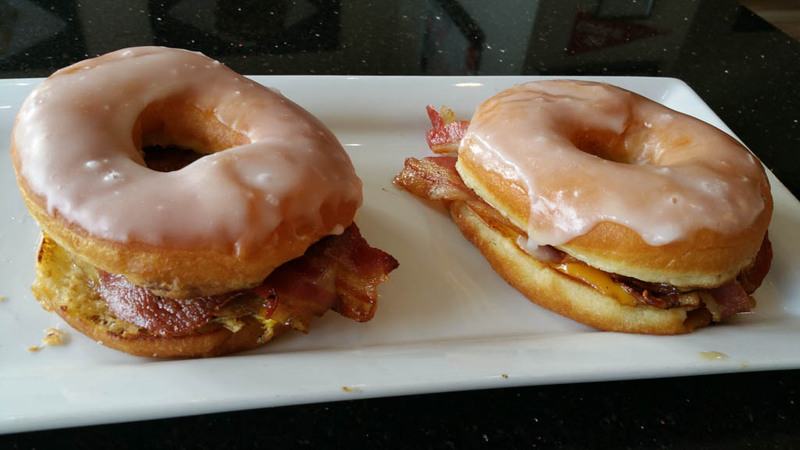 I ordered my lunch from their Glazed sandwiches menu and selected the Glazed Breakfast Sandwich, which included bacon, egg and cheese. What made this sandwich different? Well, it was served on a Glazed doughnut that was sliced in half then lightly toasted like a bagel. I wanted to taste more of their offerings, so I ordered the Glazed Grilled Cheese Sandwich with bacon. 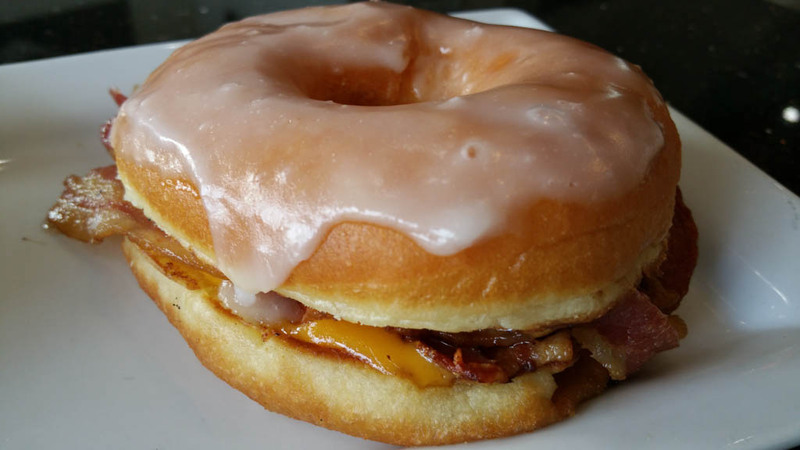 Once again, it was served on a sliced, lightly toasted glazed doughnut with cheddar cheese and bacon. The Glazed Breakfast Sandwich was different, but absolutely worked together! It was a sweet and salty combination at its best! 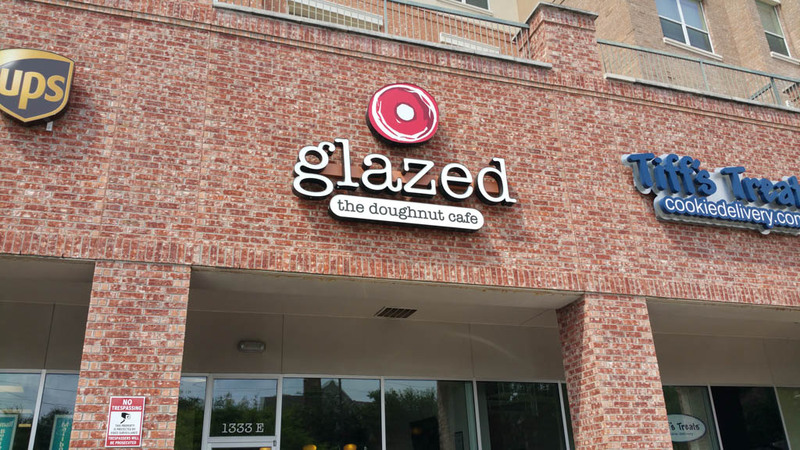 The glazed yeast donut itself was good, with a nice layer of sweet white glaze on top. 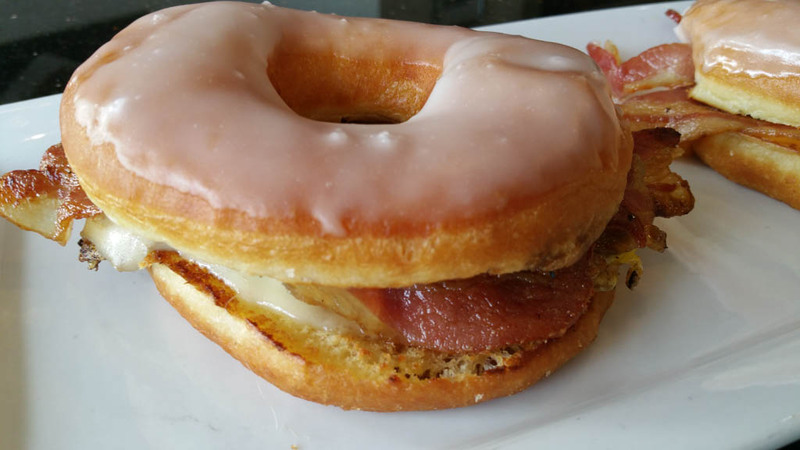 Some people would say putting a fried egg, crisp bacon and meted provolone cheese on a donut is wrong. I say it is so right! Next up was the Glazed Sandwich with bacon and cheddar cheese. I don’t know which sandwich I liked better because while they were very similar, adding an egg and changing the type of cheese definitely created a distinct difference! The bacon was perfectly cooked and of great quality. The melty cheddar cheese held everything together for the perfectly sweet and salty combination! I also ordered a Vanilla Cafe Latte. 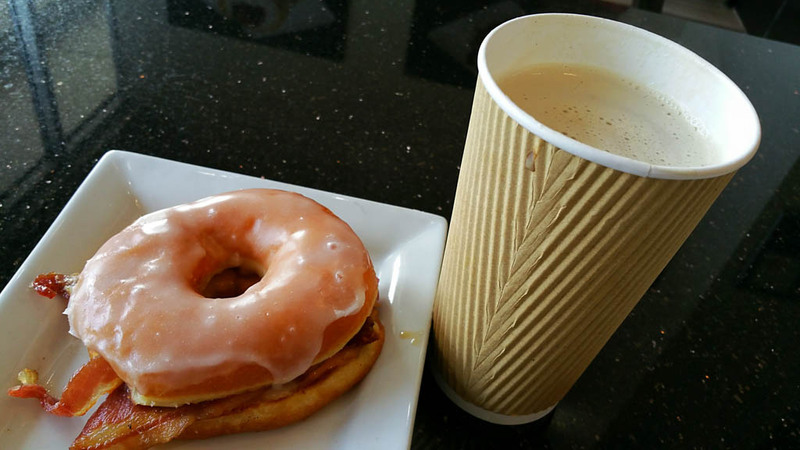 I really liked the donut house style coffee they used—not too acidic and not overly sweet. 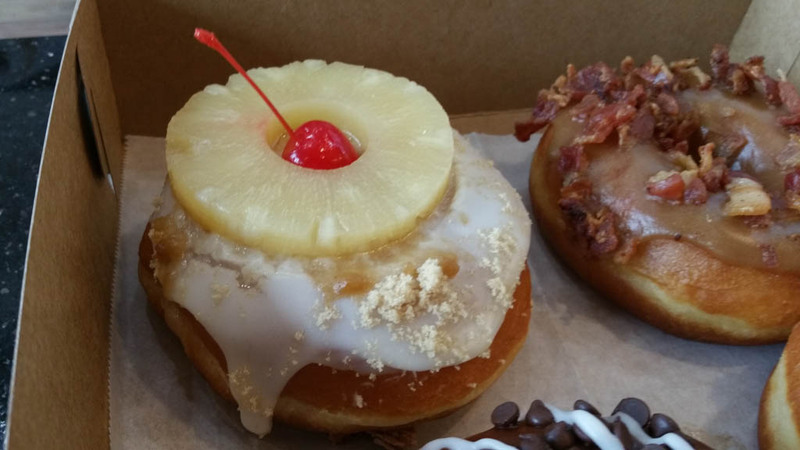 It was a perfect balance to my donut sandwiches and the quality easily rivaled that of a coffee shop. Now it was time for a tough decision! 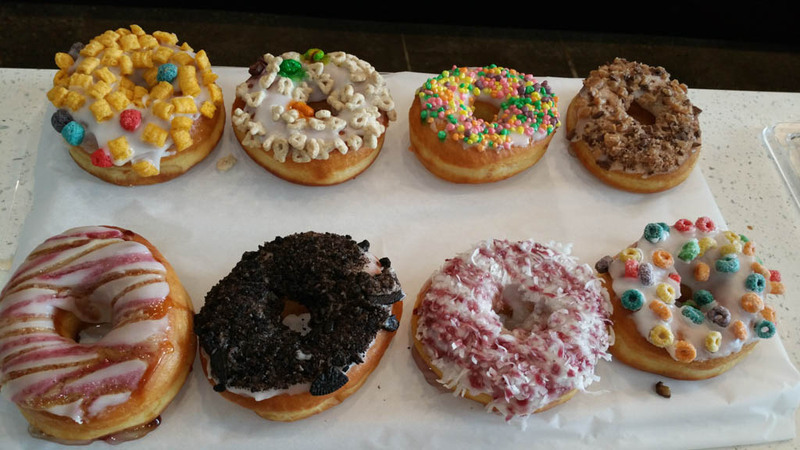 Looking at all the doughnuts that were displayed on the counter was almost overwhelming! Luckily, they had them displayed according to categories: filled, cereal topped, candy topped, and cake. I chose eight doughnuts to bring home. 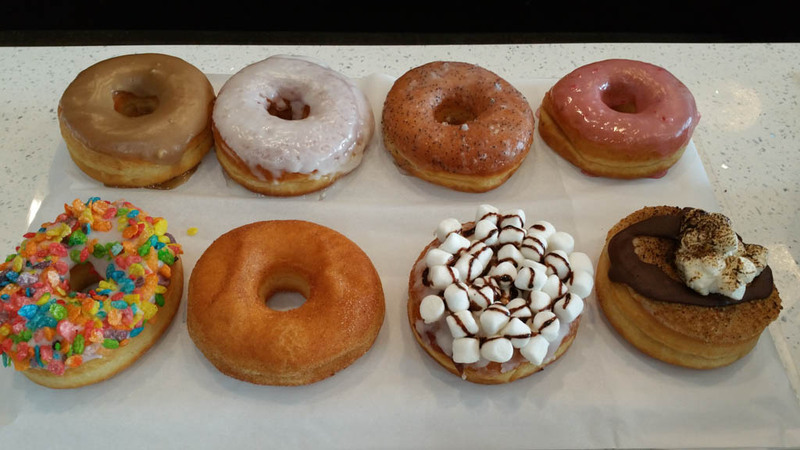 I tried the S’mores and the Lemon Filled White Frosted. I got my wife a Strawberry Cheesecake filled and the Death By Chocolate. For my son, the famous Macon and Fruity Pebbles. And finally, for my mother-in-law, I got the Pineapple Upside Down and a Raspberry Love. 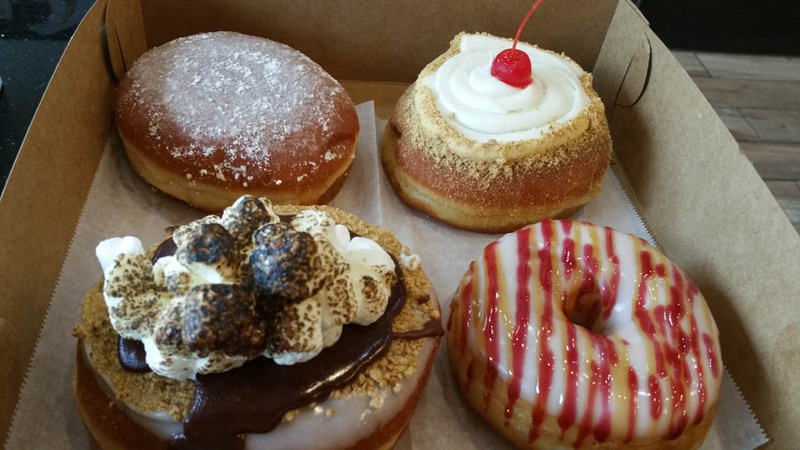 My favorite of the two was the S’mores with graham cracker crumbs, a wonderful amount of chocolate and plenty of marshmallows on top and in the center of the doughnut. 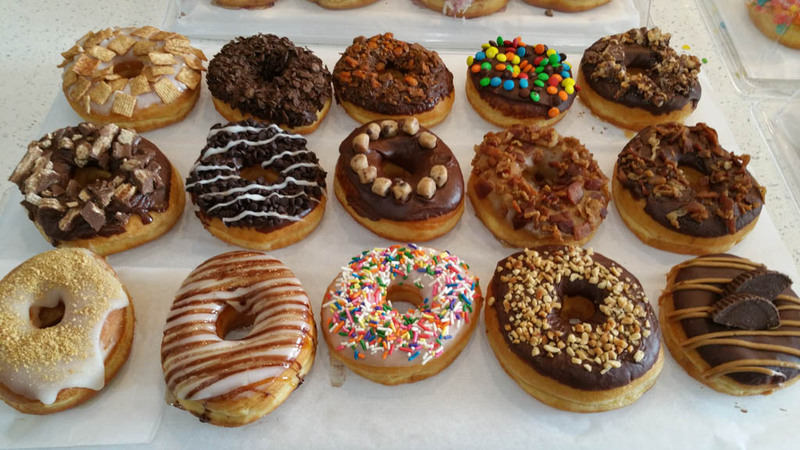 Glazed doughnuts are slightly larger and thicker than the norm, so they hold toppings and fillings well! 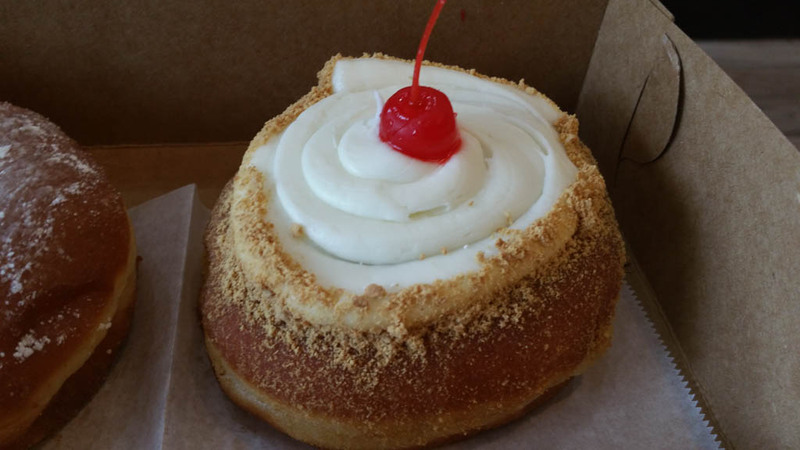 My wife loved the Strawberry Cheesecake doughnut, which was filled with a thick strawberry pink cheesecake and topped with white icing and a fresh strawberry. 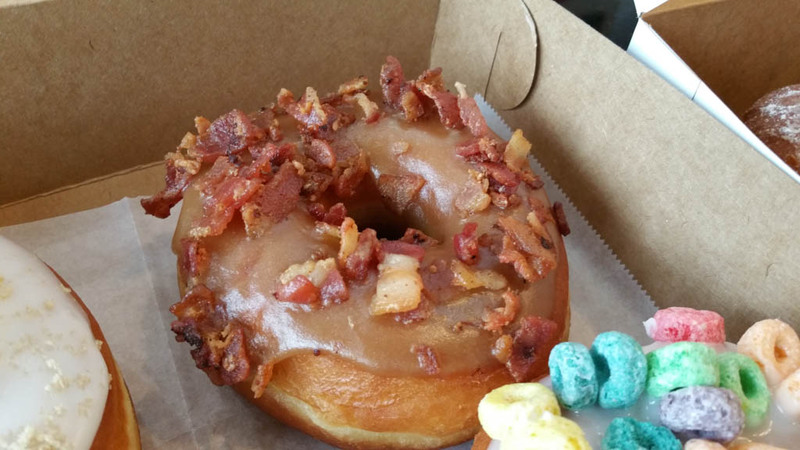 My son absolutely loved the Macon which featured maple icing topped with crispy crumbled bacon. My mother-in-law’s favorite was the Raspberry Love, because she said it tasted like real raspberries and not the artificial flavoring that some other places use. Everything was so good! 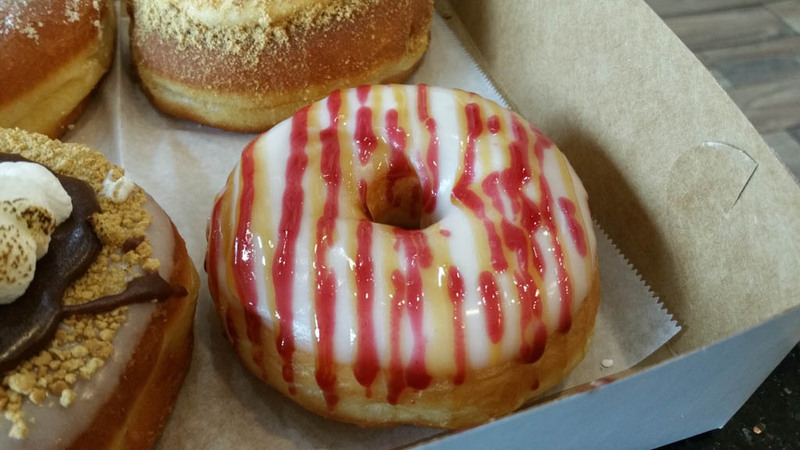 Overall Glazed Doughnut Cafe hit a home-run with their friendly service and the freshness of everything we tried! I will definitely be back to try more varieties!